A Borderline Mom: Having this problem with LeapPad 3? Black screen/dead screen? Here's the fix! Having this problem with LeapPad 3? Black screen/dead screen? Here's the fix! I may know a lot about technology, but I don't know a thing about electronics technology. If you draw me an intricate map of the innards of a computer and then tell me what each piece is called and what it does, I could probably figure out how to fix my computer in about 3 days, while taking notes and googling. 1) Take the battery out or restart the item. 2) Google my exact problem until I find a solution that works for me. 3) Contact customer service for technical support. 4) Replace it for as cheaply as possible. Part 3 is the one I sometimes skip over because I refuse to talk to them on the phone and emailing back and forth is often difficult when these companies outsource and we can't communicate at the same level of English. I've had an issue with my daughter's LeapPad 3 that was not resolved by any of my four above choices, but it was still playable and she didn't mind... then one day I plugged it into the computer and it fixed itself. And an issue I had with a LeapsterGS was the stylus didn't work. I bought a new one... it didn't work, so I plugged it into my computer and the Leap App automatically repaired it. That was GREAT! "Begin by downloading and installing LeapFrog Connect from www.leapfrog.com/connect. Launch the LeapFrog Connect icon on your computer desktop. A pop up box will prompt you to connect the device you'd like to reset. Power on and connect the toy to reset." I already had LeapFrog Connect on my computer, but went ahead and uninstalled it and reinstalled it just to be safe. Anyway, after following these steps, my LeapPad 3 was working again! 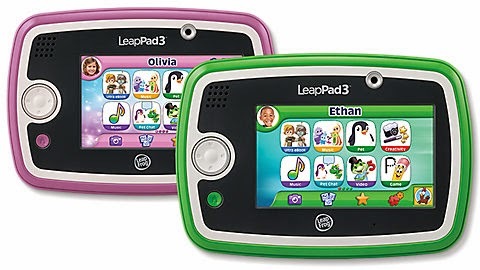 Good to note: my son's LeapPad 3 was turning on, showing the LeapPad 3 logo, then going to a black screen with red writing in the bottom right corner. You couldn't go anywhere past that. When I tried plugging it into the computer it said the memory was too full to sync, but when I tried to remove items, it would say the memory was too full to make changes. Argh! Also: once you reset the LeapPad 3, you will have to start all over with everything. Hopefully you had already set up a parent account with LeapPad Connect before, because that would allow you to put all the purchased games/apps back onto the newly reset pad. If you didn't do that, I don't know if there is any way to salvage those games. Good luck, hope this worked for you!! worth a shot, nothing else is working!